Originally this trip was to include Slovenia but due to the ice storms they had over Winter that resulted in massive OHL damage and stopped the Citadella running from Ljubljana we had to rethink our plans and opted for Croatia instead and not a bad substitute it was. A lot of hard work went into getting this trip right, especially in Croatia, so much so that a complete list of what worked what on the Zargeb – Varazdin line was compile for the two weeks prior to us going, from the HZ Mapper, just so we knew what was hauled regularly and what wasn’t. Not only was HZ Mapper scrutinized, the very same was done with MAV Mapper to make sure certain trains were what they should be. I almost came a cropper during the planning as my planned overnight EN499 from Munich to Zagreb was retimed almost 4 hours earlier due to engineering work in Austria; thankfully I had plenty of time from my flight to its rescheduled 1938 departure so it wasn’t a problem. With the tools available nowadays for planning trips I’ve found that if you put the hard work in prior to the trip then you reap the rewards during; and are a lot more prepared should things start to go wrong. A very early start on the 0536 ex Doncaster! Unlike the previous week the taxi was outside in good time and I was at the station by 0505 and the best of it was the guy only wanted a fiver; the fare usually being £5.50. The station was desolate and it was that early in the morning my train to London was the first on the screen and there was no announcement as it rolled into a silent, and slightly eerie, Doncaster. The journey was ok, no delays and the same could be said about the tube to Heathrow; thankfully the previous two days’ worth of strikes hadn’t affected the Piccadilly Line service start-up. Although I’d got the potential of the next lot of strikes to bowl me out the day I got back! Heathrow Terminal 1 was a doddle, no queues for security and no myther along the way; I was sat having breakfast by 0845; which wasn’t bad to say I’d only arrived into Kings Cross at 0729! I was so glad to be boarding a plane where there was both decorum and common sense. Having been subjected to Ryanair the previous week Lufthansa seemed like the ultimate in luxury compared! The plan wasn’t full and the 1h20m flight literally flew by. From the moment we touched down it took me 13 minutes to get onto a train at the Airport station, and I had to wait 2 minutes for it to arrive. 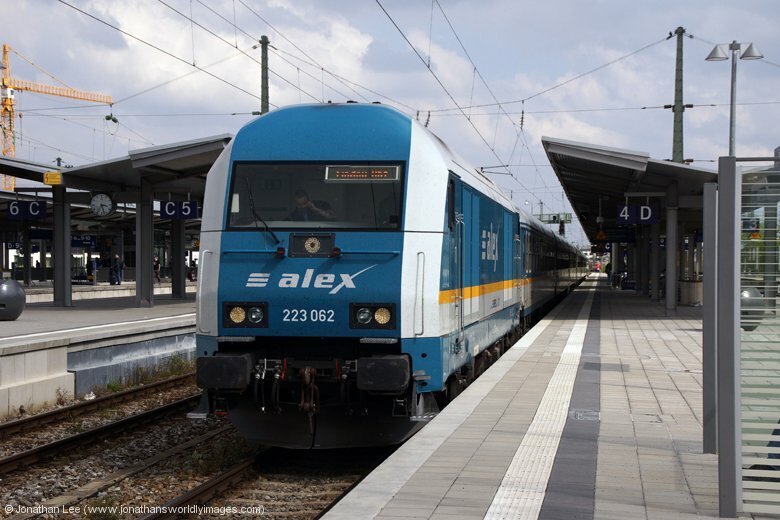 We were booked to land at 1355 and I had a half cocked plan to get to Freising for Alex train 84113 1140 Hof – Munich into Munich but as the 1404 departure only arrived at 1405 and the 1411, which I only had a plus 4 off at Neufahrn, was showing 5 late then so I decided to just do the late running 1404 all the way to Munich HB and it was full and standing all the way! 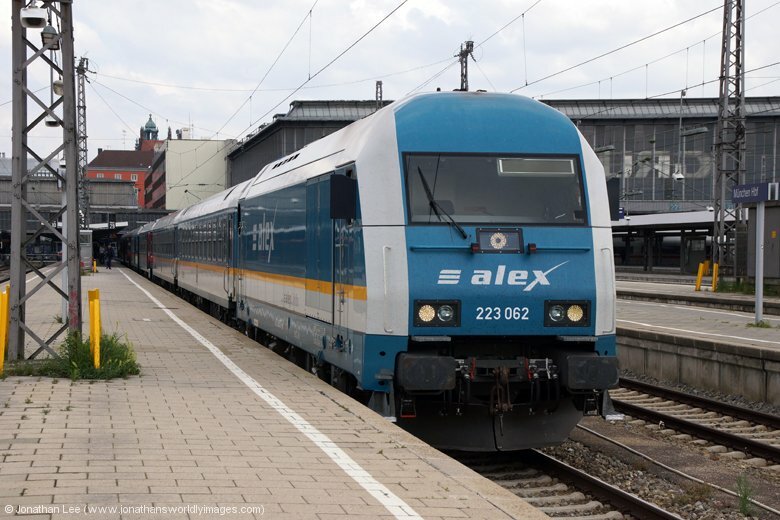 I departed Munich HB on Alex 84150 1519 Munich – Lindau with 223062 but when I’d boarded what I thought was 84150 I was surprised to see people still boarding a load three set of coaches in an adjacent platform when the set of coaches I was on started moving. I hadn’t felt the engine back on and there was a good reason for it; not only was 223062 stuck behind the set of coaches I was sat on, the gronk that was currently shunting me out of the station must have already been attached to the front of the stock when I boarded. 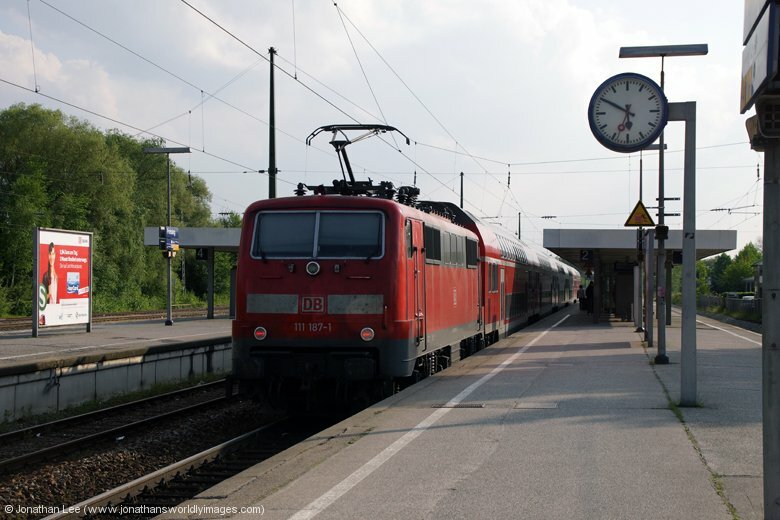 A few things were explained at that point, the fact that the stock I was on was empty, the fact that people were boarding the 1519 to Lindau in the adjacent platform and the fact that the set of stock I was on was indeed the Lindau portion being shunted over onto the Oberstdorf portion. Nobody said a word to me as I got out of the stock, while the shunted was bolting everything together, to go and spot the gronk that had just shunted me from platform 28 to 29! 362768 it was, it didn’t really mean a great deal to me at all but it was a bonus start to the day; even if it had come about through my own lack of due care and attention. It was a decent afternoon, the sun was out and it was quite warm. I’d passed T&T 111’s 111023/177 and 218472 as we’d departed Munich HB; both sets looking like they were about to drop into the station. 218488 was soon rolling in with RE57411 1408 Memmingen – Munich HB and although it put me back in to cover the 1544 Nürnberg all K could do was watch it leave with 111177 leading to Nürnberg. 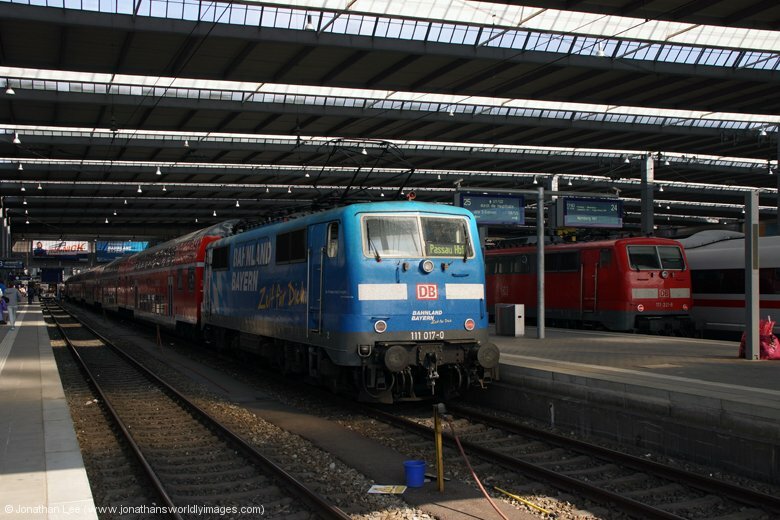 I wouldn’t have had enough time to get to the blocks from the high numbered platforms anyway and was satisfied that new 218472 was sat waiting to depart with RE57512 1552 Munich – Füssen so just saved myself the walk and boarded it. 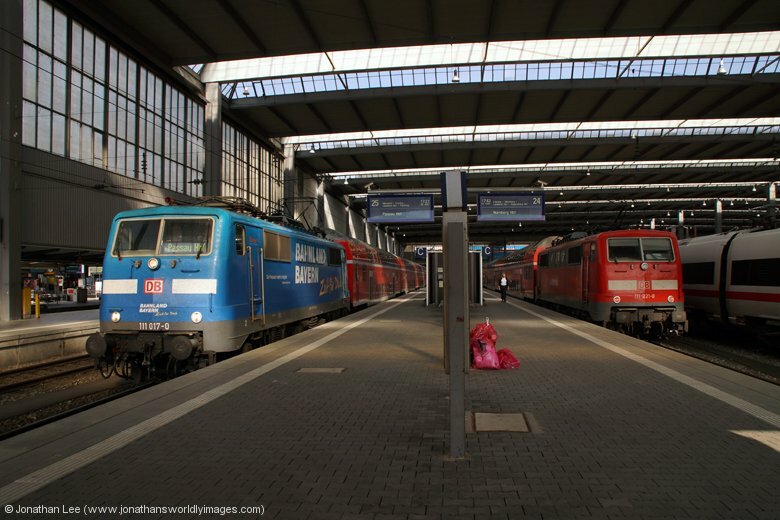 Thanks to the guard of RE57501 1406 Füssen – Munich, who was clearly more interested in her text message than getting her train away from Pasing, I made a dead at Pasing, straight across from platform 3 to 4; and it needed to be. The text message reading was over the moment my foot touched the steps of the train and the doors almost bit me on the arse as they slammed shut behind me! The third new 218 in a row, 218469, I was doing well……. As suspected 218488 was sat waiting to depart with the 1620 Memmingen, which I did back out to Pasing for 223067 back in on the 1358 from Lindau. 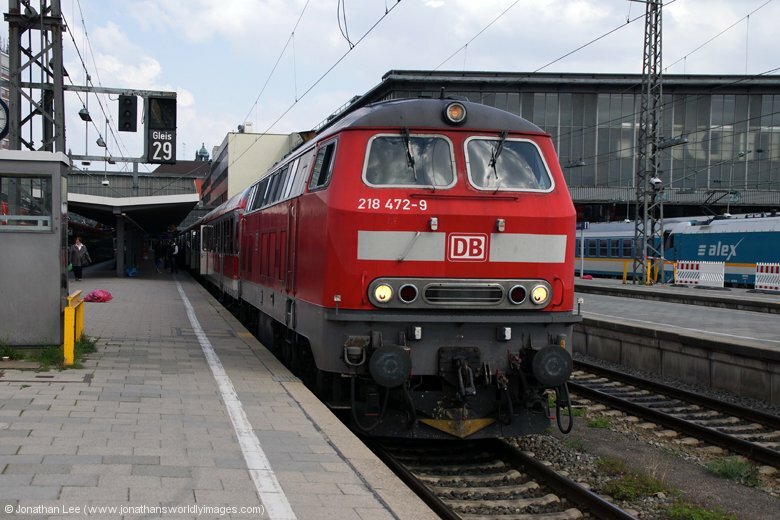 My plan was then to nip out to Munich Ost to get a couple of the Mühldorf 218’s in, a move that was sadly put straight in the bin the moment I’d walked the length and breadth of the station to find a pair of 628 DMU’s arriving on the 1655 arrival from Mühldorf! Bank Holiday or no bank holiday, there was no need for that! With no plan B at that point I went to investigate the 111’s that were currently in the station. 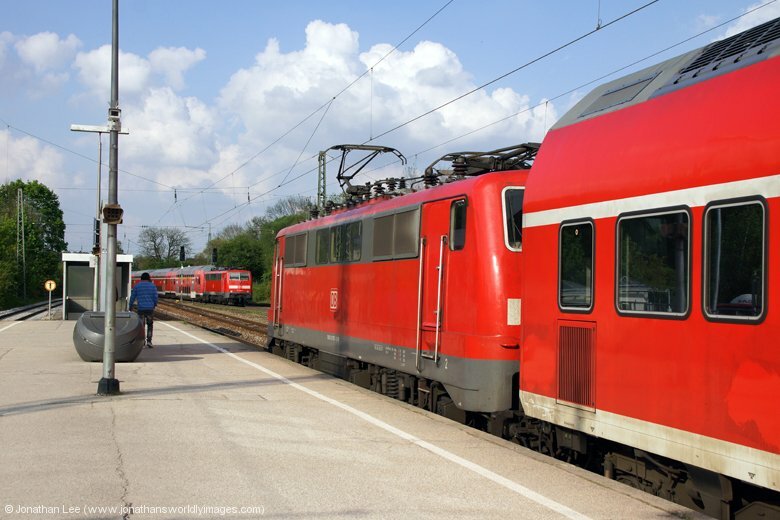 Lokvorshau had shown three 111’s to be out in the Munich area 111017, 111024 and 110039, the latter being on a Donauwörth turn and the other two on Nürnberg turns. As it happened brightly coloured 111017 was actually T&T with 111200 as they sat in, 111200 on the blocks, in the adjacent platform to 111221, which was already shown to work the 1743 Nürnberg. 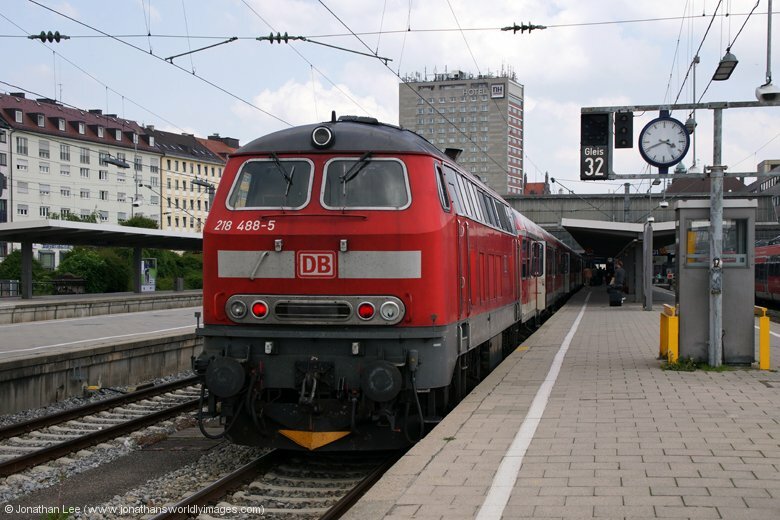 By the time I’d got back from my jaunt to the low numbered platforms the T&T set was shown to do RE4082 1723 Munich – Passau. 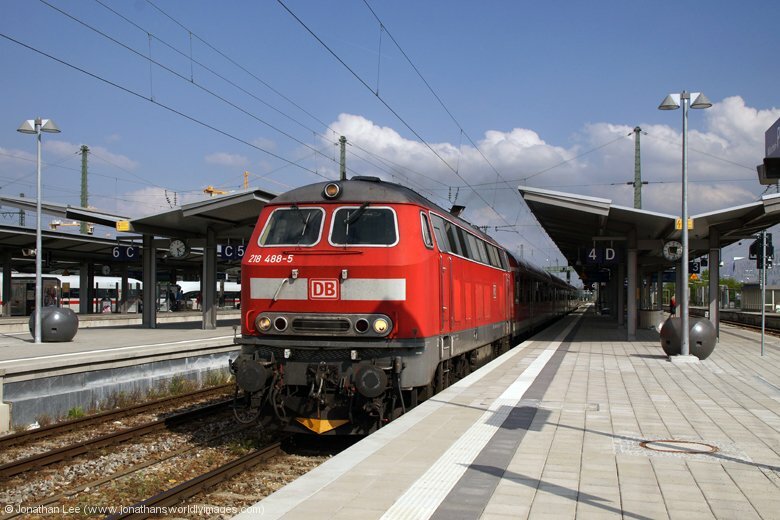 I quickly worked out that I could do them to Freising for a plus 1 onto an inbound Nürnberg or a plus 22 onto RE4079 1626 Passau – Munich; the latter being shown in the 2013 diagrams as being booked for a pair of 111’s, just has 4082 had been. I couldn’t fail; well I did! Confident that the 1626 from Passau would be 111’s I opted to photograph 111187 as it departed with RE4263 from Nürnberg and wait the 22 minutes for what turned out to be not only a single loco but 146246! Bowled! And bowled again back at Munich as I found a dud pair of 218’s, 218457/461 on the 1852 Munich – Kempten and then dud 120126 on IC2092 1845 Munich – Karlsruhe. The 218s I could understand but I’d only had two 120’s so the 218’s it was and not wanting to risk any potential dodgy plus onto my overnight, EN1199 1938 Munich – Zagreb, I did 101012 back in on IC1269 1606 Karlsruhe – Salzburg; which was just as well as dud 218492 was what followed. With 20 minutes to spare I managed to get food from one of the many places to choose from at Munich HB before watching the stock for my overnight be gronked in by 362768, propelling, with ÖBB 1116146 already attached to the front inside the gronk. Not quite what I was expecting and I was assuming that the 1116 would work through to Villach as a result. Having arrived into Salzburg early I had plenty of time to check out and engine change that may occur. I needn’t have bothered though as 1116146 stayed bolted to the train and ultimately went forward to Villach. While at Salzburg I did notice MAV 470009 arrive with what I assumed was the booked MAV 470 turn. Upon departure from Salzburg my compartment still only had me in it, which was a massive bonus, and with the next stop being Villach at 4am I was certain I’d have it to myself all the way to Zagreb; especially as there appeared to be at least two compartments with nobody in them at all. I should have booked a three berth compartment…….